This page is a brief guide for visitors to the Houses of Parliament (formally known as the New Palace of Westminster). 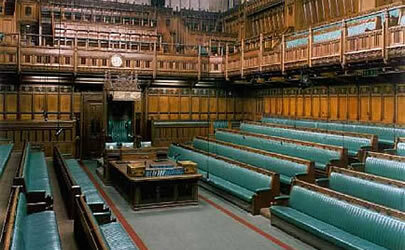 This is where the upper and lower houses of the British government (the House of Lords and the House of Commons) meet to decide national policies and to create new laws. The current buildings date from the period 1840-60, created after a fire in 1834 destroyed the previous parliament. Note that in recent years some local decision-making powers have been devolved to the Scottish Parliament (in Edinburgh), a Welsh Assembly (in Cardiff) and a Northern Ireland Assembly (near Belfast). Because the UK is a member of the European Union (EU), some decisions are made by the European Parliament (in Brussels). The photos in the next sections follow the route of a tour of the interior of the Houses of Parliament, starting at Victoria Tower and ending at the Great Hall (note that it does not include either the Jewel Tower or the Clock Tower). You can take a tour such as this in August and September each summer. This is when the parliament does not normally meet (unless there is an emergency) and is known as the Summer Opening of Parliament. There are no tours on Sundays or on the last Monday in August (a public holiday). At other times of the year tours are available only on Saturdays. Tours are given by qualified guides - it is not possible to walk around the buildings by yourself. Most tours are in English, but at certain times there are tours in French, German, Italian and Spanish (the charge for non-English tours is a little bit higher). It is a good idea to buy a ticket in advance, as there is only a limited number of places available each day. Tickets allow entry at a certain time. You should make sure that you arrive at least 10 minutes early, as you will need to go through security checks before you enter. Tours last 1 hour 15 minutes. At the end there is a shop where you can buy souvenirs such as postcards, books, chocolates or whisky, and there is a tea room serving light meals. The first part of the tour of Parliament follows the route which the Queen takes once she has arrived for the State Opening ceremony. 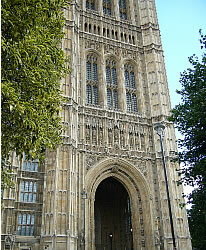 You enter Victoria Tower through the Royal Entrance. The first room you enter is called the Royal Robing Room. This is where the Queen puts on a special robe and the Imperial State Crown, which has been brought here from the Tower of London. Next you will pass through the Royal Gallery. There are two large paintings on either side: one shows the death of Nelson at the Battle of Trafalgar, and the other shows the Duke of Wellington meeting Blucher (his Prussian ally) after the Battle of Waterloo. 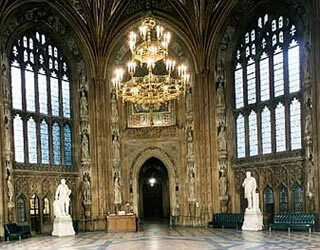 Heads of State from other countries sometimes give speeches in this room while they are visiting Parliament. The Prince's Chamber is a small area used for receiving and writing messages. This room is above the cellar where Guy Fawkes was caught with barrels of gunpowder in November 1605, planning to blow up Parliament at the time when the king (James the First) came for the State Opening. The failure of this plot is celebrated on 5th November each year by letting off fireworks and by burning a straw man known as the "Guy" on a bonfire (for more details, see the entry for 5th November on this page: Ideas/Events/November). 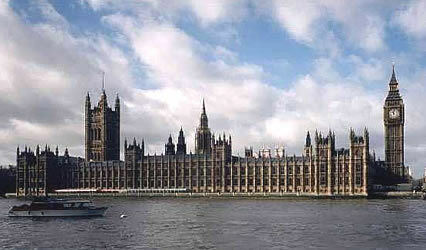 The House of Lords is the upper house of the British Parliament. In the past the members of this house were mainly hereditary peers (lords who inherited their titles because of their family history), but these days most of the members are life peers who do not pass their titles to their children. Life peers are often former politicians or people who have been leaders in their professions or communities. The main role of the House of Lords is to discuss carefully the new laws which are proposed by the House of Commons and to suggest changes when necessary. It can delay the passing of laws, but cannot stop them if the House of Commons wishes to go ahead. While the members of the House of Lords are in Parliament they may be taking part in a debate, examining laws in more detail in a committee, doing research, or perhaps dealing with a member of the public. At one end of the debating chamber is the throne. 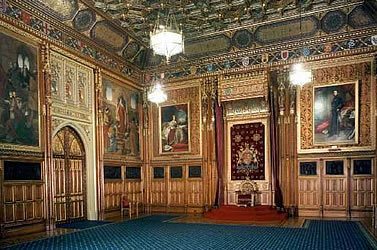 During the State Opening of Parliament this is where the Queen sits and where she reads out the Queen's Speech, which describes the laws which the current government plans to implement during the next year. This speech is written for the Queen by the Prime Minister. Along both sides of the room are the seats where the members of the House of Lords sit. These seats are red: this used to be the most expensive colour to create so traditionally it has been used by royalty and the richest members of society. 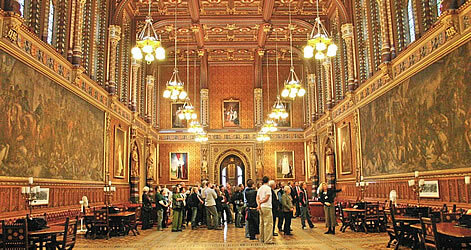 The Peers Lobby is used as a meeting place for members of the House of Lords. From here you pass through the Press Corridor to the Central Lobby. This is half way between the House of Lords and the House of Commons and is used by members of both houses. Having passed through the Commons Corridor you reach the Commons Lobby. This area was hit by a German bomb in May 1941, during the Second World War. The British Prime Minister at that time was Winston Churchill. He ordered that this area and the House of Commons should be rebuilt in the same dimensions as before, and should use as much of the original stone as possible. 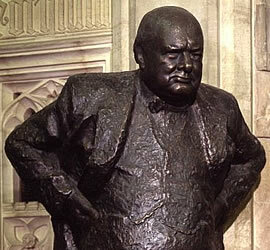 His statue is displayed prominently in the lobby (and there is another one outside, in Parliament Square). 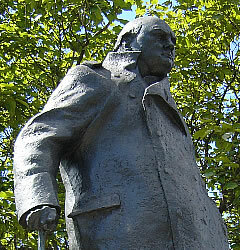 In the past politicians used to rub Churchill's foot before going into the House of Commons: this was believed to bring good luck and to improve their speaking skill (Churchill was famous for his oratory). 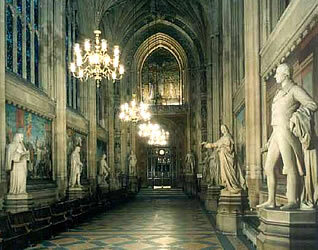 In February 2007 a bronze statue of Margaret Thatcher was placed in the Commons Lobby. She was the British Prime Minister between 1979 and 1990. During the State Opening of Parliament, an official called Black Rod walks from the House of Lords to the House of Commons to announce that the Queen has arrived and to invite them to hear her speech. It is traditional that the doors of the House of Commons are slammed shut in front of him before he can enter. He then must knock on the right-hand door with his rod and politely request permission to enter (if you look at the door when you enter the House of Commons you can see the large mark that has been created by this annual hitting of the door). 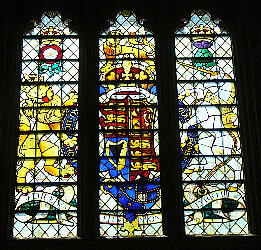 This tradition dates from the time of the king Charles the First. He believed he had been given the right to rule by God, so he wasn't pleased when Parliament refused to allow him to raise more taxes. Charles marched to Parliament to demand that his wishes were followed and to arrest some of those leaders who were refusing. 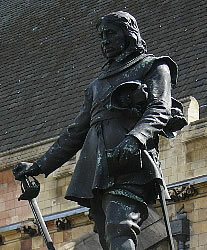 This event led to the English Civil War: England was divided between supporters of the King and supporters of Parliament (led by Oliver Cromwell, a statue of whom is outside the Houses of Parliament). The king was eventually defeated and his head was cut off. 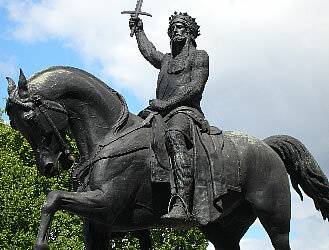 His son escaped and was later restored as king (Charles the Second), but Parliament had become much more powerful by this time and jealously guarded its independence from the king or queen. Slamming the door in the face of Black Rod is a powerful reminder of the independence of the House of Commons. Along both sides of the House of Commons are the seats, which are green. At one end is the seat of an official known as the Speaker, whose job is to keep order and to manage the debates by deciding who should speak next (people who want to make a comment often stand to attract the speaker's attention). On the speaker's right-hand side sit the members of the current Government, and on the left hand side are members of the main opposition party. There are wooden boxes on each side of the table in front of the speaker with microphones attached: these are known as the despatch boxes and are where the leaders stand when making announcements or when debating. Every Wednesday afternoon during half an hour known as Question Time there is a lively debate when the Prime Minister (PM) answers questions raised by the opposition parties. 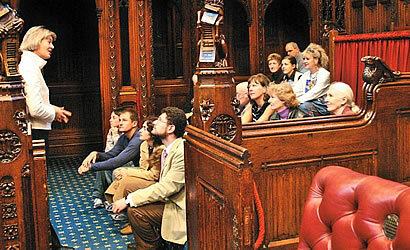 When it is time to vote on a proposed law (known as a bill), the Members of Parliament (MPs) who are present vote by going either through one of two voting lobbies: the Aye room on the speaker's right is for people who agree with the proposal ("aye" is old English for "yes"), and the No room is on the left. The votes are counted and the result is announced. Each party appoints whips who are responsible for making sure that they know the location of their party's MPs so that they can be encouraged to attend Parliament for the most important votes (an MP cannot vote unless he/she is there for the debate). All of the discussions are recorded and published, as are the voting decisions made by each MP. Every 4 years there must be a general election when members of the public can elect MPs. The UK is divided into voting areas known as constituencies. In England, Scotland and Wales the person who receives the highest number of votes is elected as the local MP in each constituency (this system is known as first past the post). The exception to this is in Northern Ireland, where the MPs are selected according to the total number of votes received by each party (this system is known as proportional representation). Each MP is expected to represent the interests of the members of his or her constituency, and spends time dealing with local issues when not at Westminster. The political party (or coalition of parties) which has the majority of MPs is asked by the Queen to form the country's Government. The leader of the Government is known as the Prime Minister. He or she appoints people known as ministers to lead each of the various departments. The ministers who lead the most important departments are called Members of the Cabinet and meet regularly with the Prime Minister to make policy decisions. Some of the most important ministers include the Deputy Prime Minister, the Chancellor (dealing with national finances), the Home Secretary (dealing with UK issues) and the Foreign Secretary (dealing with international matters). The head of the party with the second largest number of MPs is known as the Leader of the Opposition. 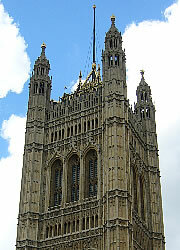 St Stephen's Hall is on the site of the chapel of the old Palace of Westminster in medieval times. 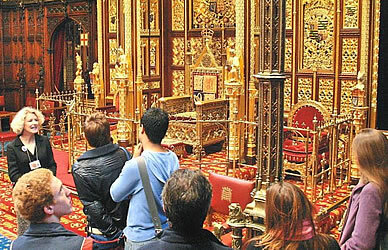 This was then used as the first location for the House of Commons: brass studs in the floor show the positions of the speaker's chair (before that the altar was here). 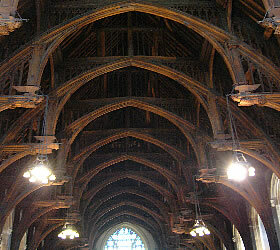 Westminster Hall was once used as a court. People who were put on trial here and condemned to death include William Wallace (1305), Guy Fawkes (1606) and Charles the First (1649). The high court moved to the Royal Courts of Justice (in the Strand) in 1825. Coronation banquets were held here until the rule of George the Fourth (1820-1830). In more recent times the hall has been used as one of the places where foreign Heads of State give speeches. It is also used for the lying in state of some kings, queens or Prime Ministers (including Winston Churchill in 1965 and the Queen Mother in 2002): their bodies are placed here for a few days after their deaths, so that people can come to pay their final respects. This hall is the end point for guided tours of Parliament. 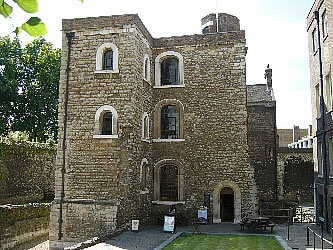 The Jewel Tower (opposite the Victoria Tower) was built in about 1365 to house the jewels of King Edward the Third, and is part of the original Palace of Westminster. The building includes an exhibition about the history of Parliament (there is an entrance charge). 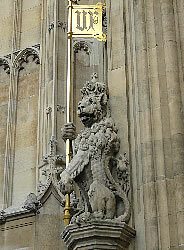 It is is managed by English Heritage. 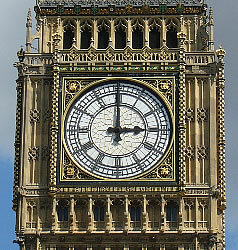 The Clock Tower is one of Britain's most famous landmarks. It is 314 feet (96m) tall. After fire destroyed most of Parliament in 1834, there was a competition to provide a clock that was accurate to within 1 second per day (most clocks at that time were only accurate to within a couple of minutes each day). Originally the mechanism needed to be wound up manually, but later a motor was installed. The clock face was originally lit up using gas lights (men had to stay there to check them): these days lightbulbs are used. There is also a small light at the top of the tower known as the Ayrton Light - this is lit whenever either the House of Commons or the House of Lords is working after dark (when the flag on Victoria Tower would not be visible). The main bell inside the clock tower weighs 13.5 tons (13,700 kg) and is 9 feet (2.7 m) wide and 7.5 feet (2.2 m) high: it was first used in July 1859. Large bells such as this are often given names: this one is called Big Ben (the origin of the name is not certain, but one story is that it was named after a very popular heavyweight boxer of the 1850's). 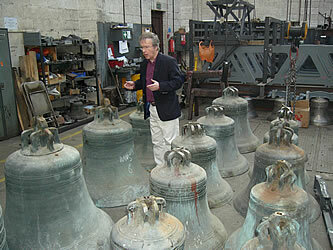 There are also four smaller bells which are used to play a 16-note tune every quarter of an hour. Each hour the large bell is struck by a hammer, once for each hour (for example, it is struck three times at 3 o'clock). The sound of Big Ben being hit is known as a bong, and the first of these sounds marks the exact start of the hour. 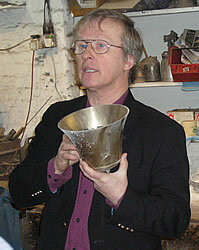 The bongs are broadcast live each evening on BBC Radio 4, at 6pm and at midnight. On New Year's Eve many British television channels show live pictures of the clock face just before midnight, and people celebrate the New Year when they hear the first of the 12 bongs. - Underground (Tube): take the Jubilee, Circle or District line to Westminster. Take the exit marked "Houses of Parliament"
While Parliament is working it is possible to visit the public galleries overlooking the House of Commons or House of Lords to listen to a debate (this is free). If you wish to do this people living in Britain can apply for a ticket by writing to their local MPs, and people living overseas can apply by writing to their local British embassy or High Commission. It is also possible to queue outside St Stephen's Entrance, but if it is busy you may have to wait a long time or may be unable to enter.